I took the photo that I used as inspiration for this painting just last Thursday. I have been amazed how long the colors of fall have lasted this year. I don't know if that is because of the drought we had this summer, but I sure am enjoying it. Last Friday was our last day in the Back Bay of Boston before our office move to the Financial District. I had been taking photos of the area during my lunch time to get some painting inspiration. When I saw this view, I knew it had to become a painting. I was able to start and finish it this weekend while working at The Artist's Studio and Gallery at Patriot Place. 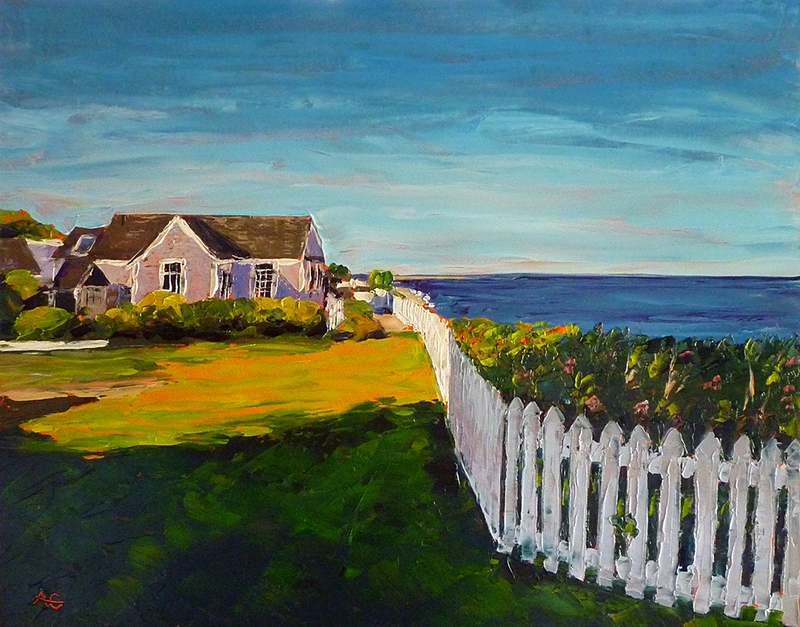 11" x 14" x .75"
This painting was inspired by a photo I took while on vacation on Cape Cod this past August. The light on the Cape is like no other-whether in the morning or the afternoon. We could see the sun rise through our bedroom window over the ocean and then in the afternoon the light would come from behind us and cast beautiful colors and shadows on an already beautiful place. We have been vacationing here-Maushop Village in New Seabury-for many years and always have a fun, yet relaxing time. How I wish the summer was not over, I miss this.